Today I am revisiting my very first blogs posts here and on my other blog Randomly Reading. It isn't because I haven't been reading, I have actually read lots of blogable books lately. I just thought it would be fun to see this again. And I still love it as much now as I did on all subsequent readings of it. Life isn’t terribly exciting in Blackbury, England in 1996 until 21 May 1941, the night of the Blackberry Blitz and the destruction of Paradise Street, where 19 residents are killed. 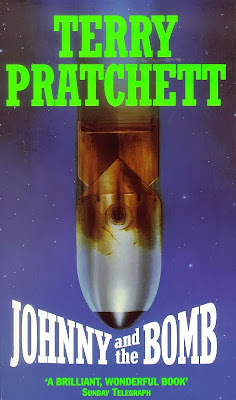 It all begins when 13 year old Johnny Maxwell and his friends find the local bag lady, Mrs. Tachyon, lying in an alley near her overturned shopping cart and her black plastic bags strewn about, blown from the past to the present by an unexploded bomb or UXB. Johnny does the right thing and calls an ambulance to take her to the hospital. And because he is a good kid, he takes her shopping cart, her bags and her demon cat Guilty home to store in his garage until Mrs. Tachyon can reclaim them. This incident begins Johnny’s foray in time travel, accompanied by his friends Yo-less, Bigmac, Wobbler and Kristy. As Mrs. Tachyon explains to Johnny when he visits her in the hospital “Them’s bags of time, mister man. Mind me bike! Where your mind goes, the rest of you’s bound to follow. Here today and gone tomorrow! Doing it’s the trick! eh?” (page 49) And because Johnny’s mind has been on his school project about the Blackbury Blitz that is exactly where Mrs. Tachyon’s bags of time take him and his friends. In 1941, Bigmac, a skinhead who finds cars with keys in the ignition irresistible, is arrested for stealing one and then accused of being a German spy. He manages to get away from the police by stealing one of their bicycles. Thanks to Bigmac, the group is forced to return to 1996 to escape. Unfortunately, when they get there, they discover that they have left Wobbler behind. Do they go back and return Wobbler to the present time? What leg of the trousers does history follow if they leave him in 1941? What leg of the trousers does history follow is they go back for Wobbler? And who is the mysterious Sir John and what does he have to do with everything? Johnny and the Bomb presents a number of interesting conundrums for the reader. Every fan of time travel stories knows the cardinal rule that if you manage to find a way to time travel, you must not change anything or you change the future. But doesn’t the very fact of your presence in a time you have traveled to constitute a change? So, can you change something and still have the same future result – more or less? Speaking of the time traveling Mrs. Tachyon, there is an interesting concept in Physics called a tachyon. Essentially, a tachyon is an imaginary particle of ordinary matter that can travel faster than the speed of light, which means it can travel back in time. It seemed appropriate to begin this blog about World War II-themed books for young readers with a time travel novel, even if the focus is not directly about the war. Historical fiction is, after all, similar to Mrs. Tachyon’s bags of time, and the novels become a portal that can transport and return me to the time period under consideration.